M.G. International Transports steht unverändert für Projekt-Logistik mit Schwerpunkt Nah- und Mittelost mit den Niederlassungen in Jordanien/Iraq und Iran. Gemeinsam mit Kooperationspartnern wird der Ausbau in Richtung Fernost vorangetrieben. M.G. International Transports still representing project logistics focussing on the Near Middle-East area with our own offices and representatives in Jordan/Iraq and Iran. Together with our partnerships our activities in the Far-East-Region have continously been exte .. The websites author and copyright owner is M.G. International. The main topic of the website is Spedition, Luftfrachts, Seefracht, Logistik, logistics, Projektspedition and projects. 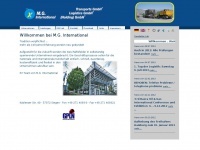 The web server used by Mgint.de is located in Germany and run by Neue Medien Muennich GmbH. This web server runs 8 other websites, their language is mostly english. The Mgint.de websites were developed using the programming language PHP and served by a Apache server. The website uses the latest markup standard HTML 5. To analyze the visitors, the websites uses the analysis software Google Analytics. Indexing the data of the website and following hyperlinks on it is explicitly allowed by robot information.